Worrying about a roadside emergency can put a damper on any trip. No one wants to be stuck on the road. Give yourself peace of mind by following these tips about how to avoid and respond to a roadside emergency. 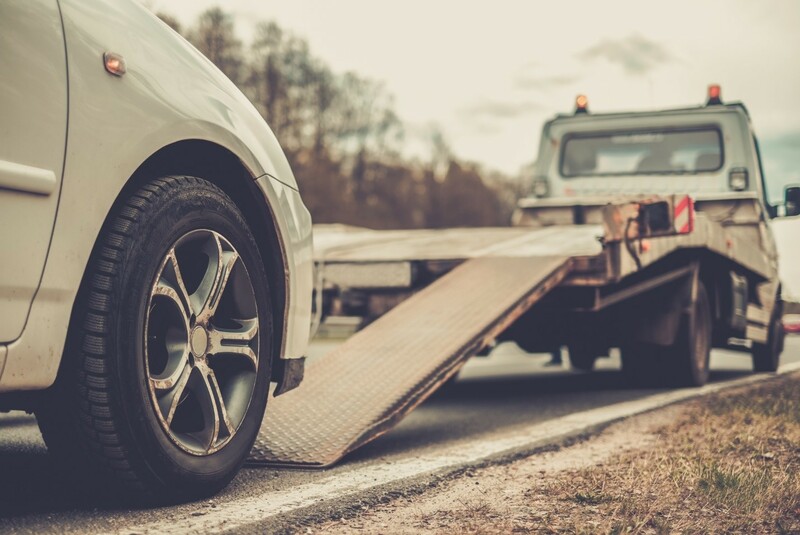 A roadside emergency includes a popped tire, forgetting your keys in the car, running out of gas, or needing a jump start because of a dead car battery. These emergencies can happen to anyone, at any time. Reduce the chance of a roadside emergency by getting in the habit of conducting periodic safety checks to make sure your vehicle is in good operating condition. A safety check includes tires, lights, belts, hoses, fluids, and windshield wipers. Take your car to a good mechanic before any long trip to ensure there are no components that are in need of repair. Take care of any issues before you hit the road. Read your owner’s manual to clearly understand which dash lights or signals indicate your vehicle is not operating properly and what to do in such situations. Always carry a well-stocked emergency kit and familiarize yourself with the use of safety flares, warning triangles and other emergency equipment. You should also program your cell phone with the number of a reliable tow truck company. Piedmont Towing offers efficient towing service and roadside assistance in Advance, NC. They are available 24 hours a day, so they can come to your aide at any time. 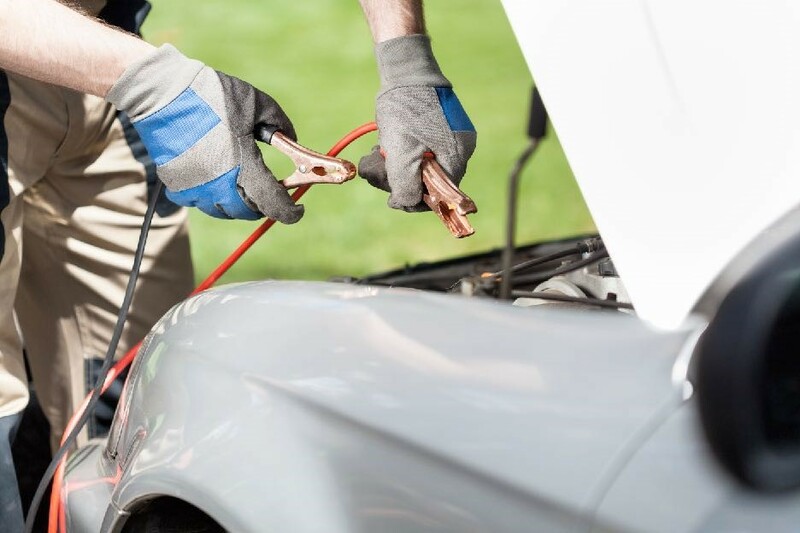 Roadside assistance services include jumpstarts, lockouts, tire changes, and fuel delivery. When you call, an experienced technician will be sent to your location to assist you. The technician will change our tire out for the spare if you have one. Fuel will be delivered in a container; enough to get you to the next gas station. If you need a jump start, the technician should have wires on hand to solve the situation. Many roadside assistance companies offer battery sales or tire sales right on the spot in case you need a replacement. Your safety and the safety of your passengers should always be the first priority. Remain in your vehicle until the tow truck company arrives. Use your emergency lights and your flares, flags, or reflectors. This’ll let people know you’ve got car issues, and that they should move around you. Never get out of the vehicle to make a repair or examine the damage on a busy highway. Get the vehicle to a safe, out-of-the-way spot, and then get out of the car. If you have a tire blowout or a flat, good roadside safety calls for moving your vehicle to a safer place out of harm’s way before attempting a repair, even if it means destroying the wheel. The cost of a new tire, rim or wheel is well worth it when it means ensuring your safety. Now you know how to keep yourself safe and keep your trip moving even in an emergency. Always remember to keep your emergency kit stocked, and the phone number for Piedmont towing at hand. Call us on your next emergency 336-998-3000. You’ve made the decision to move to the Piedmont area of North Carolina. Congratulations! Communities such as Advance, Winston-Salem, Clemmons, and Lewisville offer scenic and quaint living situations. The area’s historic small-town charm and unique subtropical climate make the Piedmont area a great place to live. Although it’s exciting, moving is one of life’s most stressful situations. Packing everything you own, renting a moving truck, and hauling your cargo for whatever distance you are moving isn’t anyone’s idea of a good time. Once you’ve gathered your belongings, you’re ready to drive that moving truck and set up your new home. But what about your personal vehicle? If your move requires long-distance driving, you may want to consider using vehicle transport service. A vehicle transport service allows you to move your car from one point to another without driving it. It requires the services of a trusted tow truck company to pick up your vehicle and transport it safely to your destination. Of course, you could just drive your vehicle; but the wear and tear that could occur on long distance trips may not be worth it. Most modern vehicles aren’t made for long-distance travel and may not function well after extended lengths of driving. Anything can happen along the way, making for a risky and uncertain trip for any car owner. The possibility of breakdowns or accidents resulting in sudden and costly repairs plus the added mileage and gas costs are enough to make vehicle transport a great value. If your move requires hours or even days of travel, also consider the value of your time spent driving. Vehicle transport offers a simple solution to all these problems. It doesn’t get much easier than using vehicle transport. Simply contact Piedmont Towing and give them the pick-up and drop-off locations to receive a quote. Once the pricing is determined, simply arrange a time for the driver to pick up the vehicle. The towing company will securely load your car onto a specialized truck and drive it to your specified location. Allowing professionals to handle your vehicle move is a low-stress way of getting your vehicle to its new destination. When researching the right auto transport company, find one that offers the best rates for your needs, but also a high level of professionalism and care. Checking online reviews is a great place to start. Luckily for North Carolina and the surrounding areas, reputable towing companies such as Piedmont Towing offer reliable vehicle transport. Piedmont Towing is experienced in moving vehicles from one place to another safely and efficiently for over 14 years. An experienced tow truck company like Piedmont can ensure your vehicle is transported damage-free and on time. Your car is one of the most important and valuable possessions you own. Don’t risk damaging it and adding extra stress and cost to your move by driving it to your new location. Let Piedmont Towing’s professional vehicle transport service can save you time and money while ensuring the safe delivery of your vehicle. We have over 22 years of experience, so make sure that you call Piedmont Towing at (336) 998-3000 for all your towing needs. Capable of handling vehicles weighing vehicle up to 10,000 pounds, light-duty towing service is appropriate for most two & four-door cars, small pick-up trucks, SUV’s and sports cars; and can be accomplished by a trained tow operator using a wheel lift wrecker or flatbed truck. Saddled with the description “light duty” it may seem like the least of towing services, but it is a service that requires special equipment and skills and is always in high-demand in and around Winston-Salem. With that said, it pays to find someone qualified to handle an item that cost you thousands upon thousands of dollars before you need the service. Choose wisely for peace-of-mind – choose a towing company that is impeccably credentialed with a stellar reputation trusted by private citizens and first responders alike to recover and transport vehicles after a breakdown or accident, or when simply in need of delivery from one location to another. Choose Piedmont Towing. We’ve been the preferred light duty towing & transport provider in Advance, North Carolina and the surrounding areas of Clemmons, Winston-Salem, and Lewisville (to name just a few) for nearly 15 years. Better Business Accredited with an A Plus Rating, we are locally owned & operated. We are a member in good standing in the Towing & Recovery Professionals of North Carolina, the North Carolina Police Benevolent Association, the North Carolina Sheriff’s Association and the Davie County, North Carolina Chamber of Commerce. We use Fleetmatics Software to ensure efficient dispatching and our tow trucks are state-of-the-art and meticulously maintained. Available 24/7, we offer rapid response, experienced drivers, competitive pricing, and every tow is insured. From simple dolly tows to flatbed transports, we handle each motorcycle, car, truck or SUV with care AND use strong nylon straps to securely tie down vehicles for safe & secure transport. Our drivers are courteous and will always handle your vehicle with extreme care. They are a welcome sight when you need lockout service, a jumpstart, fuel delivery or flat tire change. 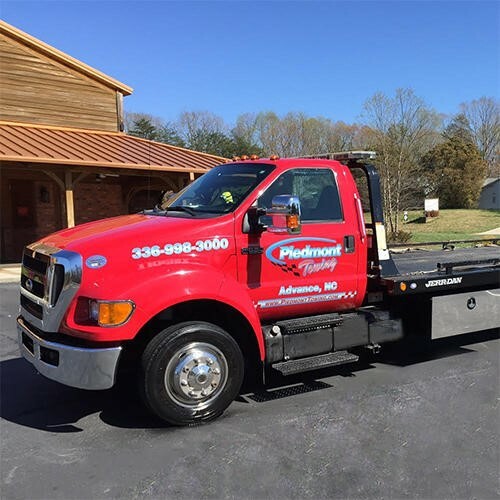 From a great reputation in the Winston-Salem area to excellent customer service, exceptional towing, transport and roadside assistance by an experienced staff operating a state-of-the-art fleet, Piedmont Towing fits the criteria that need to be met to foster confidence. Put our toll-free phone number into your emergency contacts right now so you’ll always have us at your fingertips. That number is (866) 457-4825. Just call when you need us, and we’re on our way for all your light & medium duty towing & transport needs plus roadside assistance. If you are located within a 30-mile radius of our Advance, North Carolina location, free up space in your yard, garage or driveway when you ask us to tow away any junk cars or unwanted vehicles. We’ll give you tax deduction paperwork and even pay you cash for your junker. Same goes when you’re stranded on the roadside and are finally ready to chuck your unreliable vehicle. Just give us a call and we’ll pick it up for free and offer you a fair price. We also haul away abandoned vehicles from commercial & residential parking lots and remote out-of-the-way locations. Pardon the pun, but we’re “tow-tally” the wrecker service for all your towing needs. REFERRALS & ONLINE SEARCHES. Asking for recommendations from family & friends is a great place to start, but we still recommend you research any towing company (even those referred by trusted sources) before you program its number into your cell phone. Jump on the internet to research their online presence and reputation by typing “towing service near me” into your search engine. Companies with an informative website, industry affiliations and positive reviews are most likely to be legitimate. Visit PiedmontTowing.com to learn more us, view our association memberships, and click on links to Facebook, Google +, Twitter, and Yelp to read our glowing customer reviews. 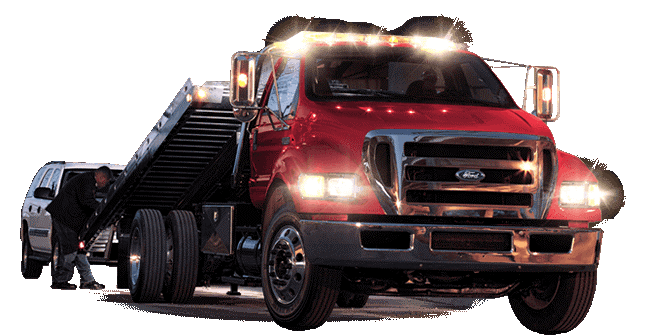 Accredited by the Better Business Bureau, we have been providing superior light & medium towing plus, roadside assistance near Lexington, NC for nearly 15 years. BE AWARE OF TOWING SCAMS. Don’t be tempted to choose a provider solely based on price. Some “towing scams” advertise a low price then tack on an additional fee per mile to rack up a high bill. In addition to low base prices & high mileage rates, some unscrupulous operators may charge exorbitant administration fees, daily storage or other unexpected charges. When they’ve got your vehicle locked behind a fence, they have you at a disadvantage. Our membership in the Towing & Recovery Professionals of North Carolina, the North Carolina Police Benevolent Association, North Carolina Sheriff’s Association and the Davie County, North Carolina Chamber of Commerce, is your assurance that Piedmont Towing is a legitimate company committed to your satisfaction. Better Business Accredited, we are always honest, and upfront about pricing. You always know where you stand with Piedmont Towing. STICK WITH YOUR CHOICE. So, you’ve made your choice and programmed the number to Piedmont Towing into your cell phone. Now, days, months or perhaps even years later, you need help. For roadside assistance, just give us a call and we’ll dispatch a truck to your location ASAP. If you’ve been involved in an accident, make sure everyone is fine, call the police and then call us. While you are waiting, be wary of any tow truck that just “happens” to show up. The operator could be a “scanner listener” who taps into police radio transmissions to troll for business. The National Insurance Crime Bureau recommends that you NEVER give permission to a tow truck operator, who arrives unsolicited, to take your vehicle. Wait for the police and Piedmont Towing to arrive! We are “tow-tally” the wrecker service for all your towing needs. Who do you Trust for Towing in Lewisville, NC? Trust is an easy word to say. But it’s not always easy to do. It’s especially true when it comes to choosing a towing company. You wouldn’t trust an average medical student to perform heart surgery. So why should you trust just any towing company to provide roadside assistance or collision recovery? Do your homework! When it comes to towing in Lewisville, NC, there are many choices. But none of them can match the credentials of Piedmont Towing. [Read more…] about Who do you Trust for Towing in Lewisville, NC?